What Day Of The Week Was October 23, 2007? 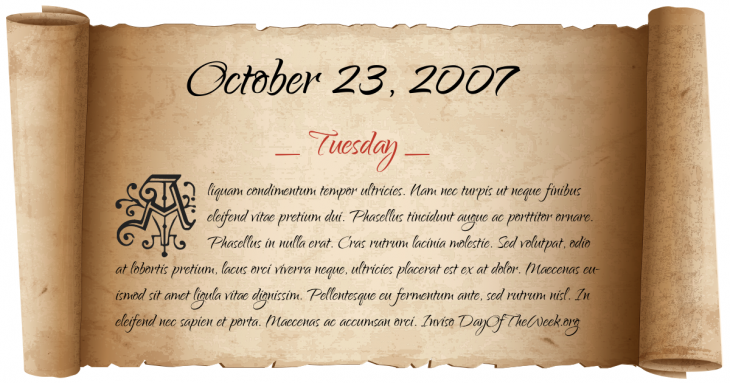 October 23, 2007 was the 296th day of the year 2007 in the Gregorian calendar. There were 69 days remaining until the end of the year. The day of the week was Tuesday. A person born on this day will be 11 years old today. If that same person saved a Cent every day starting at age 7, then by now that person has accumulated $16.42 today. Here’s the October 2007 calendar. You can also browse the full year monthly 2007 calendar. A powerful cold front in the Bay of Campeche causes the Usumacinta Jackup rig to collide with Kab 101, leading to the death and drowning of 22 people during rescue operations after evacuation of the rig.